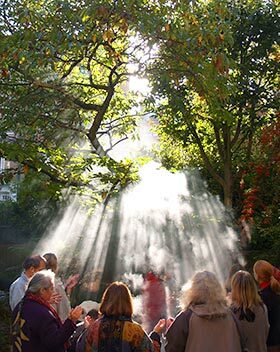 Overtone chanting  also called overtone singing, overtoning, harmonic singing, harmonic chanting, khöömii, höömii and throat singing  makes audible the natural harmonic spectrum of the voice in its pure rainbow colours, so that unearthly, angelic and bell-like tones are heard floating above the deep voices of the chanters. It is a form of chanting on one note where the partials- constituent parts (overtones or harmonics) are selectively amplified by changing the shape of the resonant cavities of the mouth, larynx and pharynx. These notes are always present in any note, but while they colour the note and give it its quality they are usually inaudible. This is a form of chanting traditionally found only in Central Asia - in Mongolia, Tuva and Tibet. In Mongolia and Tuva (Siberia), it is called khöömii (khoomei, höömii or xöömii) which means throat singing. In Tibet, in a few Tantric Colleges only, it is done by the monks as part of ceremonial practice. One form of it was first introduced into the West by Karlheinz Stockhausen in his piece Stimmung, first performed in December 1968. 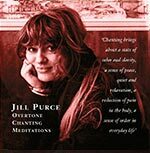 Since working with Stockhausen between 1971-1974 and with the chantmaster of the Gyutö Tibetan Monastery and Tantric College and later with a Mongolian khöömii master, Jill Purce introduced overtone chanting workshops into the west and has taught many thousands of people all over the world as part of an larger awareness of the voice as a spiritual, meditative and healing tool that all of us possess, but most no longer use.